If you have a dental emergency, please call 561-220-0049. Urgent care is provided usually the same day. All consultations are complimentary. This past Saturday the crown on one of my front teeth fell off. I had good references of Dr. Ericsson and I immediately called him up. He fit me into his schedule and did a fantastic job. He explained the procedure he recommended, involving a root canal and a post. He managed to preserve the original crown, which saved me good money. Right from the moment he applied the anesthetics, I realized what a good professional he is. It was so gentle, I barely felt the shot. He was very careful and professional and I am very happy with the results. I strongly recommend him. Ericsson Dental is hands down the best dentist office I’ve ever been to. I felt no pain whatsoever and this was truly an enjoyable experience from the amazing 4K TVs to the incredible service. Dr. Ericsson went out of his way to fix my teeth at the most favorable price on the market. It is a family owned enterprise and it truly feels like you are part of the family when you walk into this practice. People travel across the country to see him and I see why. If you have never been to Ericsson Dental I highly recommend that you start now, I promise you will be more than happy with what you are going to get. I recently was referred to Dr. Ericsson by my former Dentist. I had quite a few problems going on with my teeth and for years I didn't even want to smile anymore or have my picture taken.Dr. Ericsson took a few x-rays and in length explained what he recommended. Long story short, I agreed to a full mouth restoration! ( Especially after looking at his before and after photo album)Dr. Ericsson did an outstanding job! I constantly get compliments from my friends, strangers, and even my other Doctors.During the procedure Dr. Erickson and his wonderful staff were always so passionate and professional.Dr. Ericsson also worked out a payment plan with me over a time that was budget friendly for me.I Highly recommend Dr. Ericsson to everyone now ! Not only has this boosted my confidence and self esteem again, but its changed my life!Thank you Dr. Ericsson!! Dr Ericsson is an amazing dentist. I read his outstanding reviews and decided to use him for replacement of a bridge. Not only did he do an excellent job but his price was extremely reasonable. I would recommend him to anyone. Awesome experience. I've had Dr Ericsson do dental work multiple times and they are priced extremely well. They are accommodating and as friendly as can be. Couldn't give a higher recommendation for new patients. When it comes to a dental emergency it is important that you get the help you need when you need it. At our office we work to make sure that you can recieve emergency dentistry when it is a good time for you. If you think that your smile is a lost cause it is important that you do not lose hope. Our office is able to perform a full mouth restoration in as little as four visits! Let us help you get your smile back. Does your smile need a facelift? Are you ready to get your confidence back? Our office has over 30 years of experience in cosmetic densitry and is ready to assist you. Whether you are missing a tooth or are in intense pain our dental office is prepared to assist you. We are very experienced in all areas of Oral Surgery and can get you the relief that you need as soon as possible. Nothing is more important than making sure that you take care of your smile. Dental health is especially important at a young age. Our office is happy to assist you in making a family dentistry plan. For those who suffer from pain in the Temporomandibular Joint our office is able to assist you. Let our experienced dentist guide you through the best treatment options. Dental Implants are performed at Ericsson Dental as incrementally needed or as part of our suite of “Full Mouth Reconstructive Services”. Implants are one of the few ways humans can “roll back the clock in life”. We are restoring teeth, confidence, and quality of life at Ericsson Dental every day. “Root Canal” and “Pain Relief” are synonymous at Ericsson Dental. In the event of a toothache involving Root Canal, We will quickly relieve your pain on arrival. Maximum comfort before, during, and after any Root Canal is always prioritized. At Ericsson Dental, Periodontal Surgery (Gum Surgery) is performed as part of our suite of “Full Mouth Reconstructive Services”. The procedure is efficiently, effectively, more comfortably performed as part of “Smile Makeover” procedures. As with all procedures at Ericsson Dental, your maximum comfort is always our priority. Ericsson Dental offers a full suite of Denture Services. We are uniquely suited to provide Extractions and New Denture delivery in one day. Emergency Denture Repairs are performed in our On Site Denture Laboratory. Custom “Triad Relines” are also performed Chairside. Call us today for a Complementary Denture Evaluation. Dr Ericsson utilizes The very powerful “Arc Plasma Accelerated Teeth Whitening” Technique. The system combines powerful photonic energy with an autocatalyzed whitening agent to bring you the most powerful and effective whitening results possible. Make an appointment today to ask us about this economical and conservative option of enhancing your smile. We provide an array of options addressing the very serious condition of Sleep Apnea. We provide an alternative solution for many Sleep Apnea sufferers.The popular EMA appliance provides a more comfortable and economical treatment option than many other Sleep Apnea Treatments. Call us for a complimentary consultation to evaluate your suitability for this solution. Dear Dr. Ericsson: We are writing to thank you and express our appreciation, for making the extensive dental work you recently completed on both of us such a pleasant experience. Contrary to general belief that a visit to a dentist is a dreaded by most, the friendly atmosphere, time and effort you took to explain in detail every procedure which would be best for each of us, and the alternative solutions as well, gave us complete trust in your advice and made every visit a pleasure to look forward to. Your Expertise and hard work are all part of the wonderful results. We can’t thank you enough for solving so many restorative problems and making us able to smile ! Sincerely, Earle and Janyce Riedel West Palm Beach, Fl. Dr. Ericsson is a consummate professional. Technique is everything, his genuine desire to minimize discomfort while restoring me to perfection keeps me coming back after 24 years. Thank you for my smile. Mrs. Lorna Yuzenas Boca Raton, Fl. 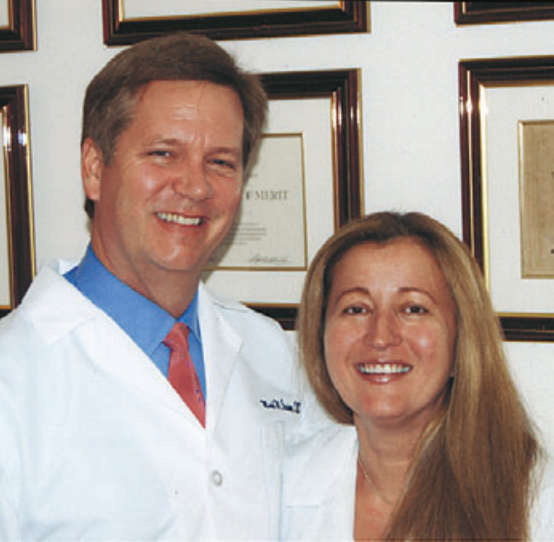 As Boca Raton Dentists, Doctors Mark and Rosanna Ericsson have been a trusted and experienced choice for over 30 years. From “Complete Smile Makeovers” to Dental Emergency Service, Doctors Ericsson have been reliably available to their clients in their time of need. In addition to Boca Raton, Dr. Ericsson broadly serves the surrounding areas of Highland Beach, Delray Beach, and Deerfield Beach for Dental Emergencies. In the event of a Dental Emergency, our Dentist Emergency Hotline is 561-220-0049. In the event of Head and Dental Trauma involving broken, injured, or lost teeth, please get to the closest hospital emergency room and/call 911 as soon as possible. After you have been cleared and released by the hospital emergency room, contact us immediately by dialing our Boca Raton Dentist Emergency Hotline 561-220-0049 so we can discuss an appropriate course of action regarding your Dental Emergency in Boca Raton, Highland Beach, Delray Beach, or Deerfield Beach. We are conveniently located between Spanish River Blvd. and Yamato Road on Federal Highway. Our convenient East Boca location is easily accessible in Dental Emergency situations for Highland Beach, Delray Beach, and Deerfield Beach residents. Dr. Ericsson consistently prioritizes compassion, comfort, value, and precision in all Dental Services. Implants, Extractions, Root Canal Treatment, Crowns, Oral Surgery, Periodontal Surgery, TMJ / TMD treatment, Denture Services, and “Full Mouth Reconstructive Dental Makeovers” are comfortably, affordably, and efficiently performed at Ericsson Dental. In selecting a Dentist in Boca Raton, one should seek an experienced, trusted and empathetic provider. As a profession, Dentistry has an amazingly long learning curve. For this reason, the experience of the prospective Dentist is of paramount importance in selecting your Boca Raton Dentist. Fine Dentistry is achieved by implementing engineering, technology, artistic talent, inherent hand-eye coordination, refined clinical judgement, compassion, and tenacity into every dental procedure. Choose Dr. Ericsson as your Boca Raton Dentist by scheduling a complementary consultation today 561-220-0047. At Ericsson Dental we put our patient\’s comfort first. We also keep up-to-date with all of the latest dentistry advancements to provide you with the best level of care. Dr. Ericsson has decades of experience in many areas of dentistry including cosmetic dentistry, emergency dentistry, root canals, and general dentistry.